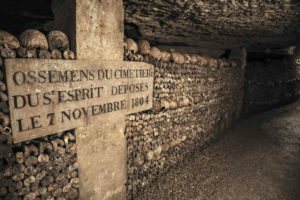 Explore the Paris Catacombs with AESU… if you dare! Paris may be a city known for its romantic scenery and unique charm, but it’s hiding a dark secret below the cobblestone streets. Underground lies a network of ossuaries, several centuries old, containing the remains of over six million Parisians. In the spirit of Spooktober, delve deep into the Paris Catacombs, and discover what lies in the tunnels beneath the City of Light. It’s currently estimated that the catacombs consist of 320 kilometers of tunnels, but specialists have only mapped a portion of the ossuaries. The city sometimes relies on the knowledge of local cataphiles, urban explorers who tour the mines illegally. Most access to the mines is restricted, and only a small section of the catacombs is open to the public. Cataphiles have been known to spend several days exploring the depths of the mines; painting murals, digging narrow tunnels and creating new maps. Initially, the bones of the dead were taken down into the tunnels with carts and placed haphazardly throughout the catacombs. As the tunnels grew, workers began arranging the bones to create more space and the arrangements transformed into shapes and decorations. The Barrel is one of the most well-known displays in the Paris Catacombs and consists of a large pillar filled with bones and remains. Many of these creations support the integrity of the tunnel system and serve a purpose great than aesthetic. This entry was posted on Wednesday, October 10th, 2018	at 9:12 am	. You can follow any responses to this entry through the RSS 2.0	feed. Both comments and pings are currently closed.